Hi there. I know it’s been a minute since we last spoke, and that’s definitely my fault. You see, although I love talking to you about my fondness for butter, flour, and sugar, and the combinations that can be made with them (yes, I definitely do), I’ve found that in order to procure such items — surprise — one needs an income. So, I am back to working full time as an attorney (in-house), and re-adjusting to that world means I have sadly neglected you a little bit. But don’t worry, it’s only temporary. I’ll settle into the rhythm and things will fall back into place around here. Creating and photographing recipes just requires energy – a wonderful, exhilarating, creative energy, but energy nonetheless. And if you’ve started a new job recently, or if you can remember what it was like to start a new job, you know the first couple weeks are tough. You don’t know how to work the copier or log into your email or find the bathroom. You don’t know what coffee shop you’ll frequent on your way into the office, or what the best walking route is to avoid those nice people from Greenpeace who just want a “minute” of your time on the street. You don’t know what time your meetings are or even what meetings you’ll have on any given day. You don’t know what’s going to be thrown at you next, and everything just feels…foreign. It takes some adjusting, but this too, as my grandma would say, shall pass. Eventually all of these things feel as natural as if you always did them, and you can spare mental energy for other pursuits. Right now, however, I’m still in that consuming early stage. I’m still collapsing on my couch every night and on weekends, and reaching for the remote instead of my computer. Speaking of, if you haven’t watched The Crown on Netflix, please stop what you’re doing and go watch it immediately. Brian and I binged it the first weekend it came out, but we re-watched it over the past couple weeks and I was reminded how the characters, the sets, the music – everything – are just so good. Philip is such a jerk and Elizabeth is so perfectly aloof. I’m dying for season two! But you didn’t come here to listen to me wax on about TV, so let’s talk about something that will make our lives infinitely easier – and better, in my opinion. One of the things that easily falls by the wayside on weekday mornings, when you’re running out the door and are likely to leave your keys and your lunch sitting on the counter behind you, is a good breakfast. I’m not talking about the cereal sugar that was marketed as “part of a good breakfast” to us as children – I’m talking about real, stick to your ribs, full until noon breakfast. The problem with that kind of breakfast is it usually takes a while to prepare, and to eat, and time is a precious commodity on these mornings. So, the best meal of the day is often reduced to hastily microwaved oatmeal, prepackaged granola bars, or — dare I say it — nothing at all. Ugh. The struggle is real, I know. We deserve better! Here’s how we rectify this situation: do a little prep on Sunday so a good breakfast is easy, no thought required. I’ve already talked about the wonders of baked oatmeal a little bit on here, which I discovered during my long law firm days. So if you haven’t already checked out this maple & brown sugar baked oatmeal, and you’re a warm bowl of oatmeal kind of breakfast person, go do that. If you’re a grab and go kind of breakfast person, however, stick around. We can accommodate you too. 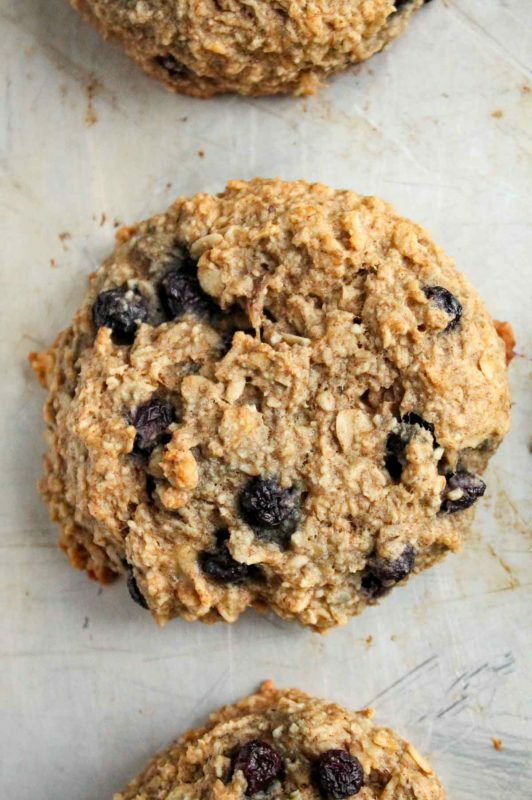 These banana oatmeal COOKIES are just as hearty and satisfying as a bowl of oatmeal, but infinitely more portable and exciting because – seriously, who doesn’t want to eat cookies for breakfast? No one, that’s who. 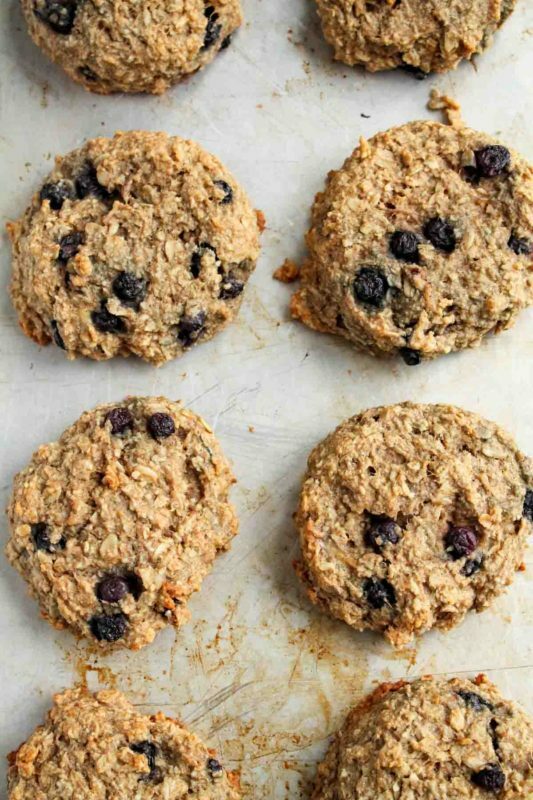 And listen, you don’t need to feel guilty about eating cookies for breakfast now, because these are literally made with oats, banana, coconut oil, some spices, and a tiny bit of pure maple syrup. I added blueberries too just for kicks, but they’re definitely optional. 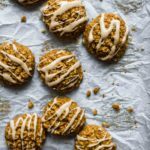 These cookies are chewy, soft, spiced, slightly sweet, accidentally gluten-free and vegan (who am I?) – and they are so easy to make. 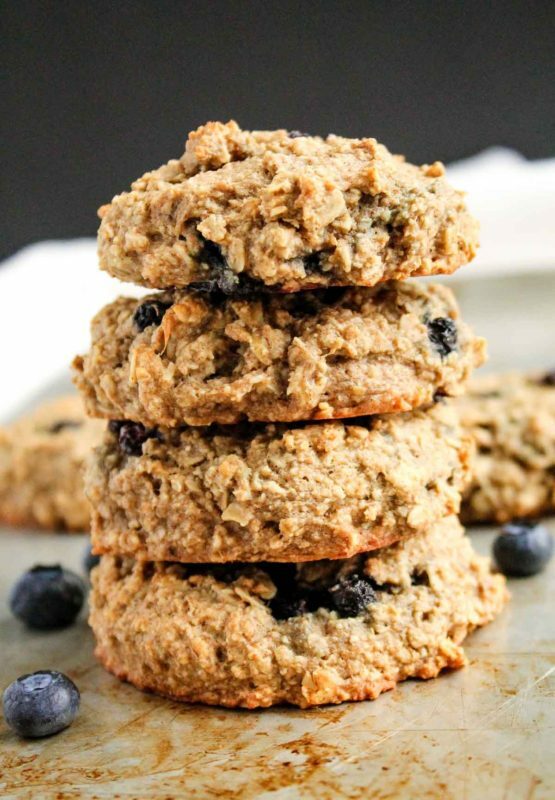 It only takes half an hour, one bowl, and a blender for making oat flour out of rolled oats. Yeah, we can have our cake (err, cookies) and eat it too. For breakfast. I like to scoop big, thick cookies with this batter, so I get about 8 large ones from this recipe using a 1/4 cup scoop. Then I wrap them individually in plastic wrap and eat one (or two) for breakfast each morning, preferably with peanut butter if I’m at home, but they’re just as tasty eaten plain while sitting at an office desk too. You could always make smaller ones and eat them throughout the day. This recipe fits around your morning schedule, not the other way around. I made these tonight, Sunday, at about 10pm after watching Girls, and I can’t wait to have them in the morning. Brian didn’t wait…so we’re down two. Looks like I’ll have to make them again before the week is out. Darn. 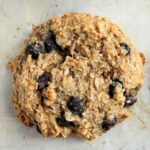 Thick, chewy, naturally-sweetened banana oatmeal breakfast cookies are easy to throw together on a Sunday to have breakfast ready for your week! 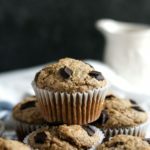 Preheat oven to 350 degrees F. Place 1 cup of the rolled oats in a food processor or high-speed blender and blend until the oats become a flour-like consistency (you now have oat flour). Place in a large bowl. 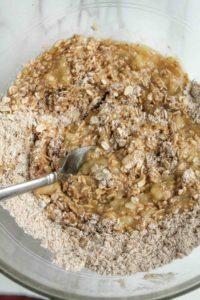 Take the other 1 cup of rolled oats and place in the same food processor or blender, and pulse or blend on low speed until the oats are in small pieces - about 30 seconds. Do not grind them into a flour. Place in the same large bowl with the oat flour. 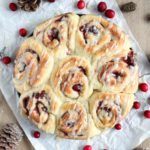 Whisk the oat flour, chopped oats, baking soda, cinnamon, and salt together. 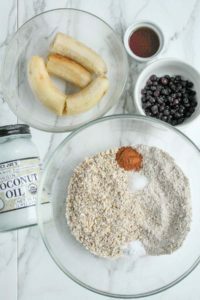 Add mashed banana, melted coconut oil, and maple syrup to the bowl and whisk (I like to use a fork) until everything is well-blended. Fold in the blueberries gently with a spatula, if using. Scoop batter using a 1/4 cup measure (or ice cream scoop - just make sure it holds 1/4 cup water first) onto a baking sheet lined with parchment. Bake for 20 minutes, or until edges are golden. *NOTE: steel-cut oats will not work in this recipe. 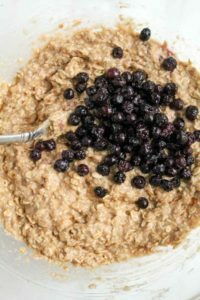 Use the flat, old-fashioned rolled oats! 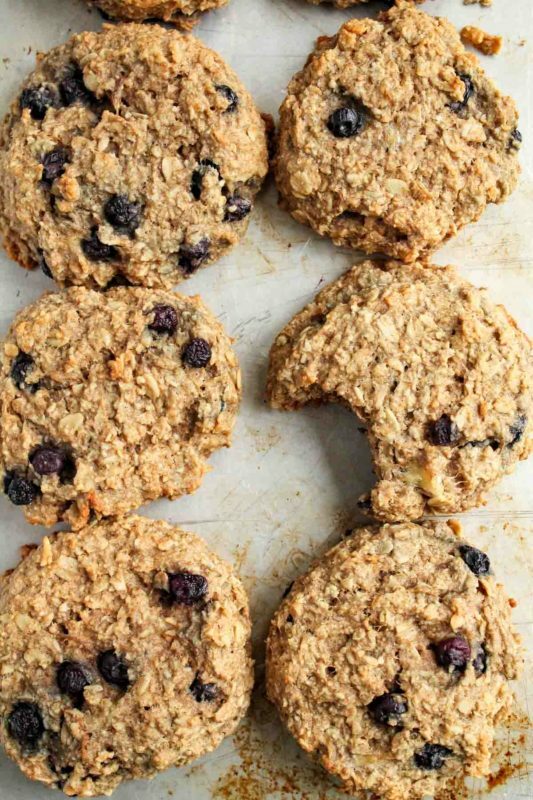 Enjoy a cookie plain on the go, or top with nut butter or yogurt for a delicious breakfast! Cookies keep for 2-3 days well-wrapped on the counter, or 1 week in the fridge. You can also freeze them wrapped individually in plastic wrap, and then microwave for 15-20 seconds anytime you need an instant healthy breakfast or snack! There were amazing. 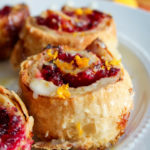 I made these with homemade jam and they were awesome for my two year. I think teh blueberries are what help bring out the subtle sweetness. I did use 1/2 agave and 1/2 maple syrup from what the recipe calls for but these were quick. I also loved you banana whole wheat waffles. I have made large batches to freeze so they are a quick grab and cook for our daughter int eh morning. I cook those alone side with other. This past week was your cooked. Thank you again.